Uniting Communities is the first charity and first SA-based organisation to go carbon neutral, and has reduced their emissions by over 30% since their journey began in 2010. 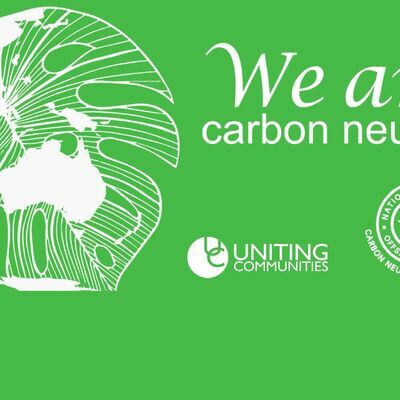 In November 2017, Uniting Communities was announced as Carbon Neutral Adelaide’s first Ambassador. Uniting Communities are acutely aware of the emerging impacts of climate change and their responsibility in taking action in the interests of their clients, staff, volunteers and the broader community. Their decision to work towards carbon neutrality was Board approved in 2010 with the view that the process of becoming a carbon neutral organisation will lead to significant operational savings, improved efficiencies and positive recognition for the leadership taken. Uniting Communities see this commitment as an essential part of their continued efforts to not only be in the best interests of their clients, staff and volunteers, but to all of the South Australian community, and positively contribute to the global impact on climate change. They strongly support Carbon Neutral Adelaide and would encourage other organisations to get involved. Since the inception of Beyond Carbon Neutral (BCN) in 2010, Uniting Communities have reduced their carbon footprint by over 30%. This has been achieved through a variety of means which can be summarised as changes to policy and processes, building upgrades and behaviour change. A consultant/program manager was engaged in 2010. Uniting Communities’ BCN Committee maintains an ongoing emissions reduction plan. Each year this plan is reviewed in full with input from the organisation’s leadership team and BCN site representatives. The plan is also reviewed at each committee meeting, both to monitor progress and to discuss any new ideas. Whilst being conscious of the organisation’s largest emissions sources, initiatives are developed for all sources. Behaviour change initiatives are ongoing and largely implemented by their Site Representatives who identify and implement emissions reduction opportunities with their teams. Central campaigns also occur and have included Switch Off, Buy Green and Y-Print. Always seeking to do things properly, they have gone above and beyond the minimum requirements of the National Carbon Offset Standard (NCOS) by implementing a carbon management system in which their emissions data is captured. The system is also used for monitoring and reporting on emissions to leaders across the organisation. Integrating low carbon thinking and behaviour within the business has been a key theme throughout the journey so far and an ongoing focus. For example the Finance Team has taken responsibility for data management and controls, carbon has been integrated into management reporting and procurement, and their committee now reports directly to the Executive Group. Emissions reduction is supported by capital and operating budgets allocations each year allowing building upgrades to create guaranteed savings - in emissions and dollars. These investments have more than been repaid in operating cost savings and will continue to do so. View the Uniting Communities video about their carbon neutral journey. Visit the Uniting Communities website. Uniting Communities are the first charity and SA organisation to go carbon neutral, reducing their carbon emissions by 30% since 2010.